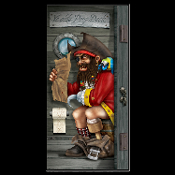 Hilarious bathroom door cover, featuring a grimacing Pirate Captain, complete with Peg Leg in dire straits! Watch out for that hook!!! Halloween Door Cover Captain Hook Sitting on the pot, giving it all he’s got! Humorous Door Cover Restroom Design is plastic, so can be wiped clean. Plastic Door Cover that can be placed over your toilet closet door or use as part of a Scene Setter. Great addition to any tropical paradise, birthday party or pirate scene, etc.